This rail system connected Halifax Harbour to Sullivan’s Pond and raised vessels approximately 55 feet and transferred them a distance about 1,250 feet. This is a second attempt to overcome the distance in moving vessels from the Harbour to Sullivan’s Pond and during the first attempt a series of 5 locks were used. Parts of these locks remain buried on the property and the walls of Lock 3 can still be seen as they form the east and west walls of the turbine chamber for the Canal Greenway project. Because the marine railway system was the second to be constructed on the waterway, it posed fewer problems than the first one constructed at Portobello. It is easy to imagine the lock keeper, Henry Findlay, operating the system from the upper level of the flume house, as he would have given directions to his assistant who would have been standing on the small platform of the boat cradle. Under normal circumstances the boat cradle could be transported between the Harbour and Sullivan’s Pond in a time of between 12 and 15 minutes. The Story of the World famous Starr Manufacturing Company is deeply intertwined with that of the Shubenacadie Canal Waterway. In 1863, the Starr Manufacturing Company built a nail factory which drew power from the Flumehouse turbine to drive the factory’s great network of gears and pulleys.. Soon after, Starr began to produce skates which became world famous and everyone was wearing them. The King of Spain had a pair, as did many hockey teams across Canada, professional and amateur. Starr was also the first company to make and sell hockey sticks. The stick, crafted by Mi’kmaw artists was called the “Mic-Mac” hockey stick and helped popularize the game of hockey in Nova Scotia. After selling millions of skates around the World, Starr stopped making skates in 1939, but created some well-known works such as the entry gates at Point Pleasant Park. In 1998 the Starr Factory burned down and was demolished a few years later. The Starr Manufacturing Company remains an integral part of the Canal Greenway’s legacy, which is being commemorated at the site, and is near completion. The round grindstones the factory used in the process to manufacture skates. Archaeologists have excavated a number of these grindstones at the Canal Greenway site. 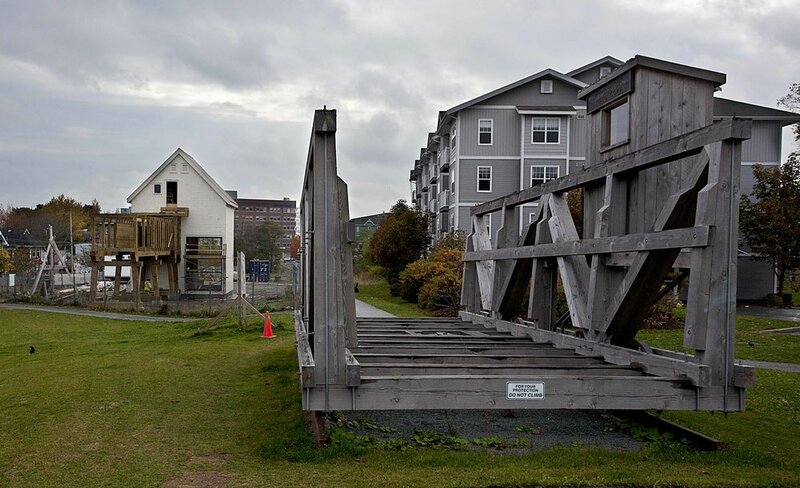 Did you know a life-size model of the Dartmouth Inclined Marine Railway actually exists and will be the feature of new outdoor interpretive space for the Shubenacadie Canal Greenway? It is located on the original site of the Dartmouth portion of the Shubenacadie Canal Marine Railway and the original site of the Starr Manufacturing Company. It has taken many years of planning and archaeological excavation to bring this important piece of Nova Scotian history alive. The first step for this project involved uncovering the turbine chamber that would have held the turbine that powered the Marine Railway. The turbine that was exposed was used by the Starr Manufacturing Company after the Marine Railway closed. The excavated turbine chamber has been restored with additional masonry work. A life-sized marine boat cradle replica is also located on site. It sits near the same spot where the inclined plane was. The cradle would have originally travelled over the inclined plane with a boat or barge carrying goods. Located directly on top of the turbine chamber was the Flume House. A life-size replica of the Flume House, and its interior gear is on site and nearing completion, complete with flume. We will continue to update you on the Canal Greenway’s progress, including an opening date for its outdoor exhibits.